I’ve been actively writing some of the top guides for Naruto Online game players. If you missed my previous guides and articles check them out. In this article I’m going to share some important tips with Summoning Treasure. The summons will help you increase your battle power and gives the main character an additional chase. So, let’s move on to the Summoning Treasure Guide. There are 3 types of summons you can get which are Common (Blue), Uncommon(Purple) and Rare(Orange). You can easily get the Blue and Purple summons from the summon locations. Take a look at the screenshot on how you can get to the Summon location. As you can see, click on the (i) button for the summon you want to get. It is also important to get the right summon that will create additional chase and combo for your team. Once you click on the (i) button you will see the location like the screenshot below. 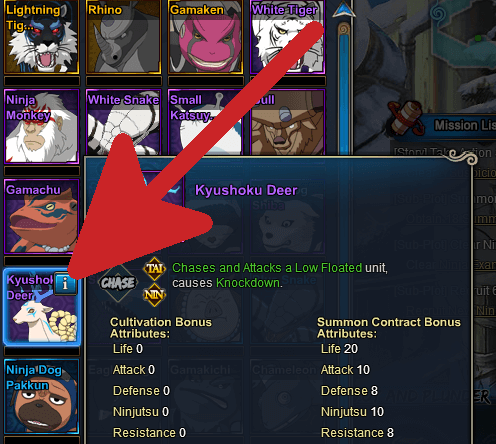 Once you click on the (Capture: Summon – Kyushoku Deer), you will be taken to the summon location. You will arrive at the summon location like the screenshot below. 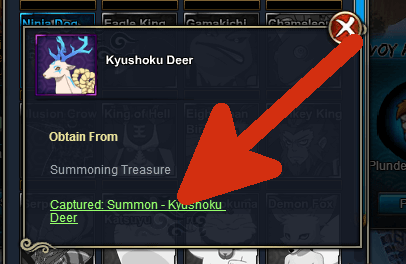 Once you reach the location just click on the summon and battle with the summon. The first time when you battle with the summon, you will get huge number of summon fragments with summon runes. I will talk about summon runes later in this article. You will have 3 attempts to battle with the summons daily. After the first battle, you will only get 2-3 summon fragment each time you have battle with the summons. It will take approximately 4-5 battles to get the complete summon. Although you can battle up to 10 times to capture summons, it is limited to only 3 times for each summon. As I’ve mentioned earlier you’ll be able to get the Blue and Purple summons this way. If you want to acquire Orange summons, you need to draw summon scrolls from Summon treasure. You will get one Orange summon for every 60-70 summon scroll draws. 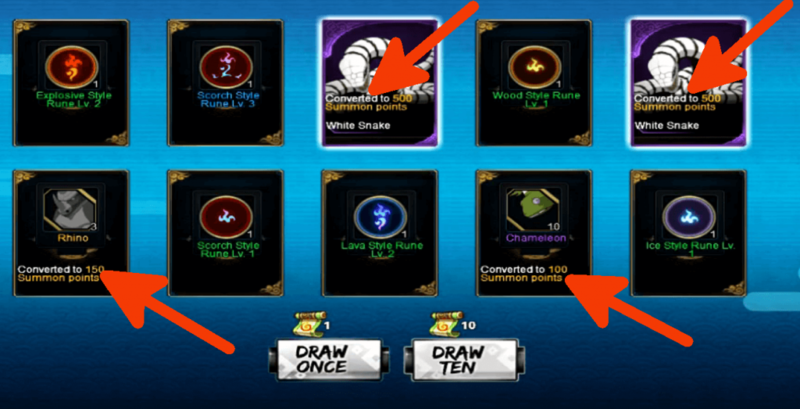 Moreover, you can also get summon runes when you draw summon scrolls. 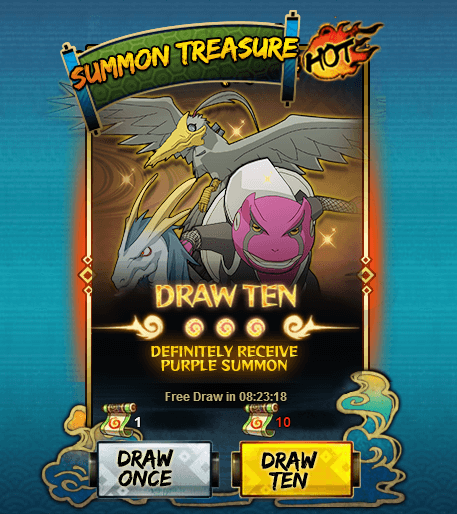 ** Only draw summons from Summon Treasure once you have at least 60-70 summon scrolls so that you don’t have to waste time and keep drawing for every 10 summon scrolls you get. 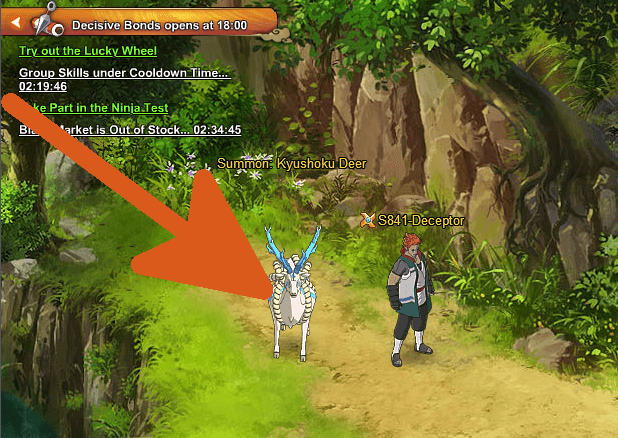 Let’s take a look at the summons available in Naruto Online game and their abilities. If you have a complete summon and get the same summon again it will be converted to summon points. You will receive runes when you increase the number of summons you have as a reward. Summon Runes are available in some of the events as well. The maximum level of runes will be level 10. The higher the runes level the better the attributes you get. A newly added feature to the summoning. There are two type of resources you need to perform cultivation. Summon cultivation adds permanent attributes to your ninjas regardless whether the upgraded summon is used. You need to complete each of the forces to increase your summoning jutsu level to unlock other summons. Take a look at the following screenshot. As you can see in the screenshot, each hexagon need to be completed using the unbound runes and coins. Once all the hexagons are completed, you can use the summon contract to advance to the next force. Cultivation is not only the best way to increase your battle power but also to improve the summons effectiveness. However, you can improve your cultivation slowly overtime. This is the complete guide to Naruto Online’s summoning. If I missed out something important on this summoning guide, please do share it with me by commenting below.